First sowing, originally uploaded by mike1727. Spring's so close you can smell it; crocus and iris in flower, tulips pushing through quite well, even in the containers at the front (north facing). Daffodils out everywhere (except in our garden), hawthorn(?) and a few cherry blossoms on roadside trees but nothing on next door's cherry trees yet. 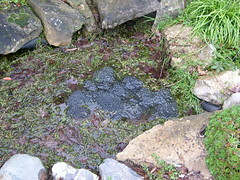 The resident frogs have been busy spawning again; first croaks heard last weekend, first spawn around Wednesday and more appearing daily. Randy little buggers. Looking back, I photographed spawn in mid March last year; I think it was a week or two old then which means the frogs are spawning maybe a week earlier this year. That's not really conclusive evidence of any underlying trend, but it has been very mild this winter. Early peas. Sown in guttering (2 x 1m rows) to get an early start and for easy transplanting once the seedlings are big enough to cope with pigeons and slugs. Broad beans. Red and green, 10 each in 3" pots- should do just under 1/4 square metre. Sweet peas. Mixed scented. Some in individual 3" pots, others 5 to a 5" pot. I'm not sure how well these will germinate in an unheated greenhouse, they probably need a propagator lid to get them going. Carrots. Early globe. Broadcast into a 12" bulb pot since all the beds have been heavily manured this season. Potatoes. First earlies. 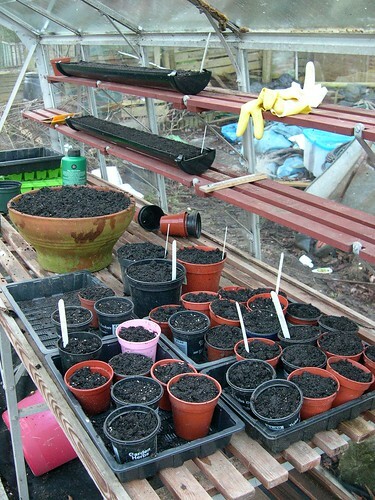 Some in heavy duty refuse bags filled with compost from last year(3 to a bag), 6 in one of the raised beds. The beds are still quite wet, hopefully not so wet as to cause rot. Shallots. A couple of rows in the sunniest raised bed. Probably squirrel food, they need protecting. Garlic. A couple of rows next to the shallots. About half of last week's planting of tomato seeds have germinated; cherries first, followed by the beefs and Moneymakers. The biggest are about an inch tall and growing fast. Fruit tree pruning. Before they blossom, possibly a spray too though no sign of reappearance of the canker(?) they had a couple of years ago. Sowing. Another batch of tomatoes if I can find space for another propagator, half a gutter of lettuce, a few courgettes, sweet corn, cabbage (? ), Marigold and a few other border annuals to fill in gaps. Hanging baskets. Look for plants to raise from seed. Slug traps. Drown the buggers in beer.